In last night’s titanic struggle between the Cincinnati Reds and the San Francisco Giants, a hapless Dan Otero in relief for the Giants missed his release point and hit Joey Votto smack in the thigh. No big deal; he wasn’t trying to do it. He was probably just so desperate to miss the Votto wheelhouse that he went a little overboard. When I say “guy speak,” I’m not just talking about words, but all those interactions between guys that are a natural part of the sociology of being in the pack. I’m not talking about interactions among responsible adult men, with stock portfolio and prostate concerns. I’m talking about those things that make innate sense to guys but are utterly mystifying to women–wrestling past the age of 10, “pre-gaming” before a night at the clubs, and being willing to go into a bar’s single-person restroom to pee in the sink if total strangers are already using the stall and the urinal. So, while it’s probably mundane and instinctively understood by dudes, to me the hitting of Joey Votto was a social event worthy of further consideration. This is what I saw. After an unsuccessful attempt to get out of the way, Votto stood stock still for a moment, expression blank, even though that had to smart like hell. He started to turn around to take the base, but first picked up the ball and threw it back to the pitcher while maintaining slightly-longer-than-social, unsmiling eye contact. The whole thing lasted about five seconds. “What does that mean?” I actually said out loud to no one in particular. The failure to react is probably just tough-guy stuff: there’s no actual injury there, so don’t let ’em see you sweat. Not so mysterious, I guess. Then it was over. Votto takes first to load the bases. A shaken Otero walks Brandon Phillips to walk in a run, and the Big Inning proceeds. But then it gets interesting again. In the top of the ninth inning, Sam LeCure exacted a retribution pitch, throwing behind Buster Posey. Not Sandoval, not the pitcher, but the corresponding character on the Giants’ team. If a guy punches you in the gut, you don’t punch him in the hand, you get him in the gut back. This action is a team acting as a whole. I know that MLB tries to quash this sort of thing, and promptly warned both benches. Wouldn’t want the little kids and old ladies in the crowd to think it’s OK to stand up for your friends. But I think that to remove this stuff from the game is to rob baseball of the genuine, if somewhat primitive, team/pack dynamic. Obviously, baseball doesn’t want to cultivate the Ron Artests of the world, but there is a happy medium between brute and physicist, and it is called “guy.” And watching that balance unfold is what makes the game so fascinating. The march to .500 continues! Apparently, all the Cincinnati Reds’ offense really needed was a weekend trip to the friendly confines of Chicago. Now, they’re ready to take on awesome pitchers like Matt Cain and make them beg for mercy. Or at least run up their pitch count and send them running from the mound. The Reds got the scoring started against the San Francisco Giants in the very first inning. Drew Stubbs doubled and Brandon Phillips drove him in with a two-run home run. 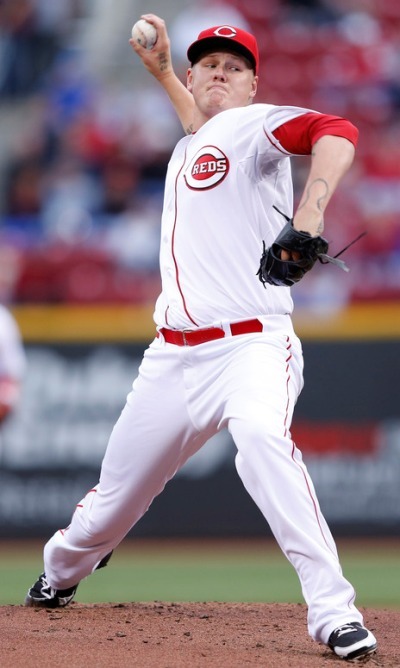 After that, it was a pitcher’s duel, with Mat Latos showing off the skills that enticed the Reds to trade for him. And this time he even made it through the 5th inning! His final stats: 7 innings, 4 hits, 2 walks, 3 strikeouts, and 0 runs. Latos unlocked the code in terms of how to prevent getting a loss with this previously AWOL offense: don’t allow any runs. You may not get a win doing that, but you surely won’t get a loss. But getting his elusive first win was no problem for Latos and the Reds tonight. In the 7th inning, Ryan Ludwick knocked Giants starter Matt Cain out of the game with a solo homer. The Giants bullpen came in and failed to find the strike zone. With the bases loaded, Brandon Phillips walked. Next, Jay Bruce hit a beautiful line-drive down the right field line to score a couple. And old-man Scott Rolen hit a double to drive in a couple of his own. The 7th saw the Reds send 10 batters to the plate and score 6 runs. And that was pretty much the end. The Giants did score a couple in the 9th, but that was somewhat due to an old-fashioned bean-ball battle. Votto had been hit during the 7th, and Sam LeCure threw at Pablo Sandoval in the 9th. Both teams were then warned not to do it again, but there really is no better time to proteect your slugger than in the bottom of the 9th with 1 out and ahead by 9 runs. All in all, it was a great game, for me as a fan and probably even more for the Reds players. The offensive explosion felt long overdue. Game 2 of the series against the Giants is tonight at 7:10pm. Bronson Arroyo will start against Barry Zito.